A few months ago, my fellow supers-enthusiast Carrion Crow hosted the Forgotten Heroes challenge. I submitted the Liberty Legion, which got me thinking about all those great WWII-era comics: Sgt. Rock, Our Army at War, GI Combat, and of course, the Invaders! I have always loved the Invaders; in fact, I love almost anything where Nazis are the main bad guys (they’re just so suited for it). From the battlefields of WWII, America’s first super-team: The Invaders!!! 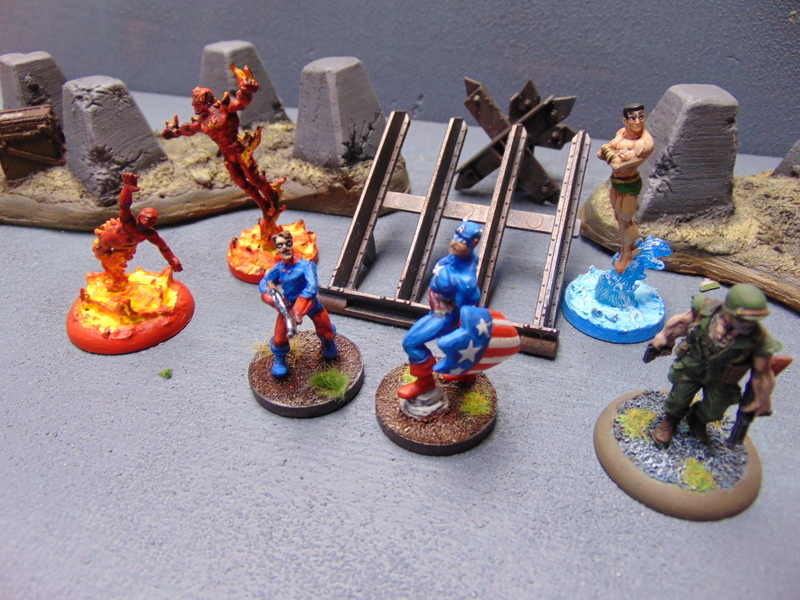 From left-right, Toro, the (original) Human Torch, Bucky, Captain America, and Namor, the Sub-Mariner; with special guest Sgt. Nick Fury (sans the rest of the Howling Commandos)! 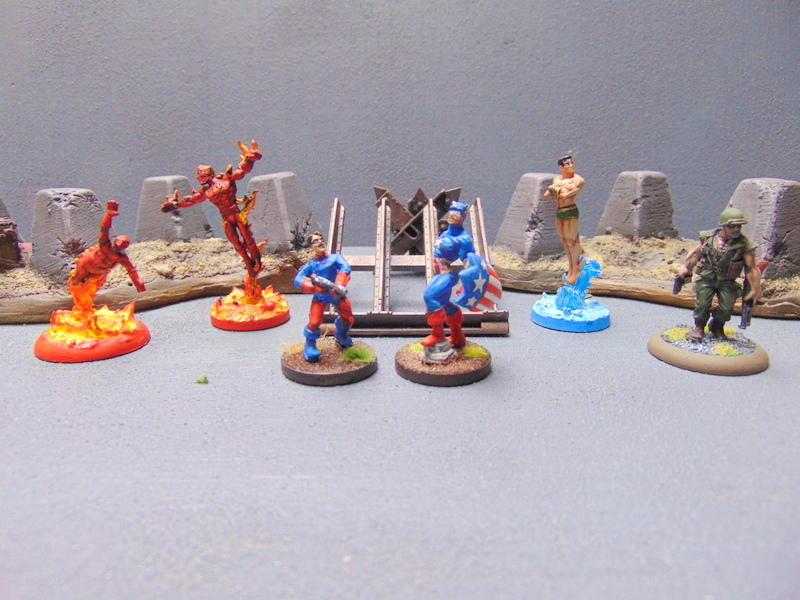 The Human Torch is a Heroclix Fantastic Four Human Torch. Since there’s very little difference in their appearance, I decided he could pass for his WWII predecessor. Toro is yet another Human Torch miniature, this time from TSR’s old Marvel Super Heroes line. 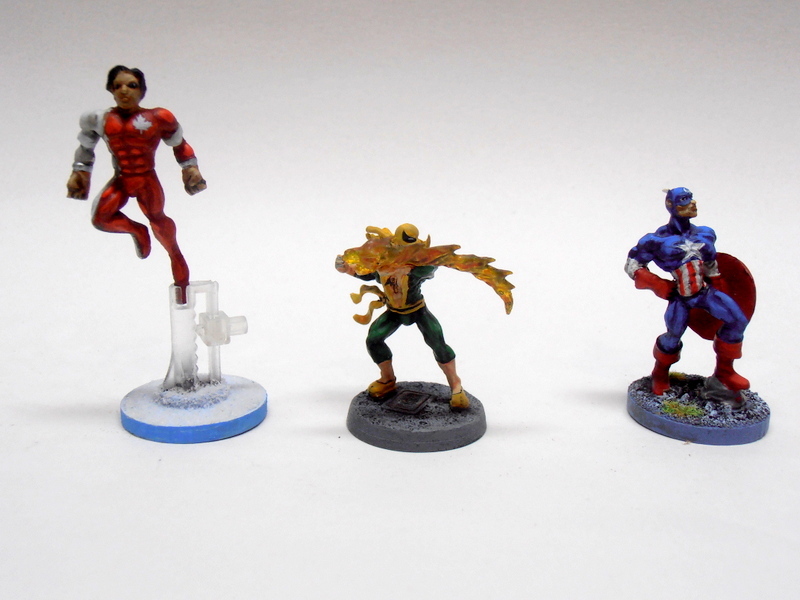 I’ve used some of these old TSR miniatures before in my X-Men team. 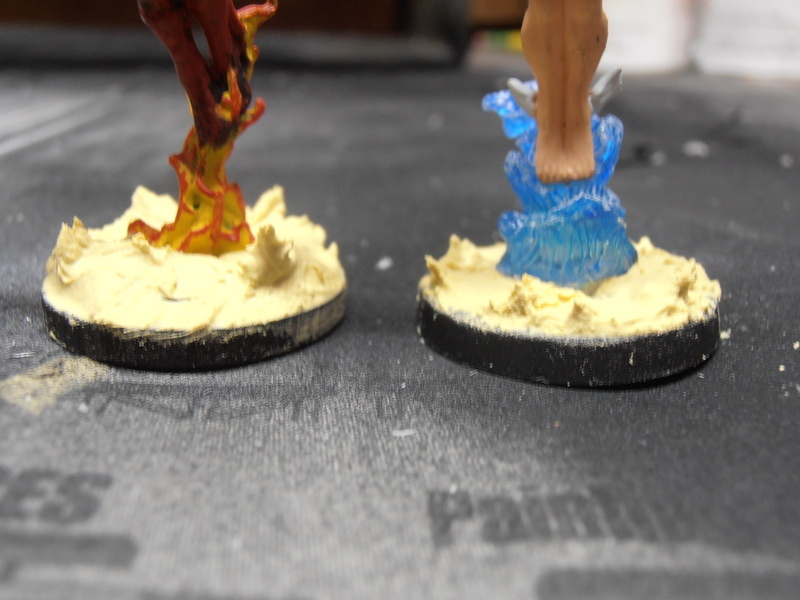 The TSR Torch miniature is noticeably smaller than the Clix version, which makes him ideally suited to represent the original Torch’s sidekick, Toro. You may remember Bucky from the Liberty Legion post. Captain America is a “unique” Heroclix version of Cap from the first ever Infinity Challenge set. It’s essentially the same sculpt as the regular Cap, but with a kite shield instead of the round one. I painted him a brighter blue than my other Cap to distinguish the two. 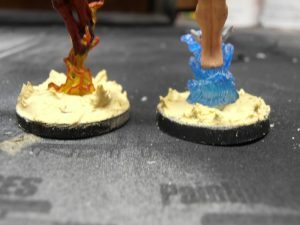 Side note: to make the flame and water effects on the bases, I used a pretty simple trick. I applied some Elmer’s wood filler to the base (wear gloves unless you enjoy having it on your fingers for days) and teased it into shape. Let it dry overnight. When painted, it looks pretty good! 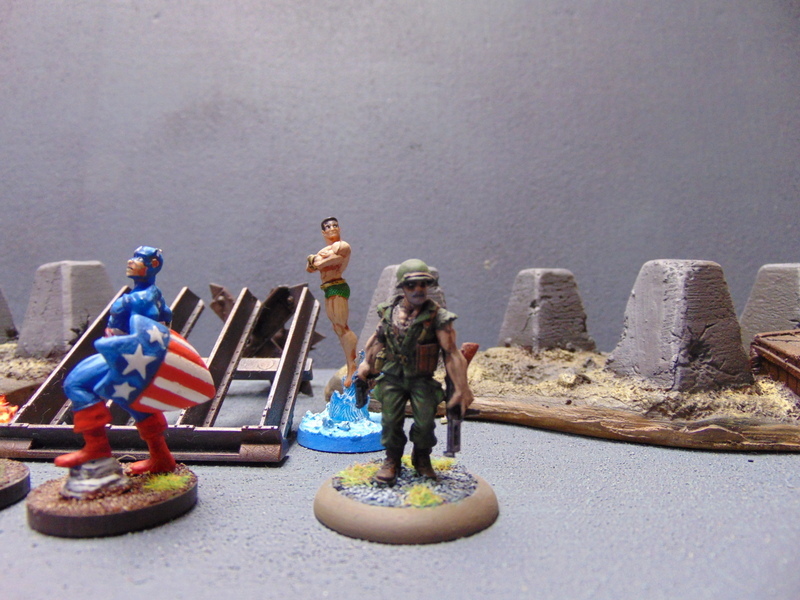 I actually painted “Nick Fury” a few years ago, but I couldn’t resist including him with the rest of the Invaders. This is Sgt. Mack Torrey (50120) a Reaper miniature from their Chronoscope line. He just looks so battle-weary and badass that I knew he had to be my Sgt. Fury. Now I need to get some cheap 28mm Germans and play some skirmishes! Thanks for the shout out, Keith. Nice work on your Invaders. And nice to see Toro included, as usually he gets forgotten. 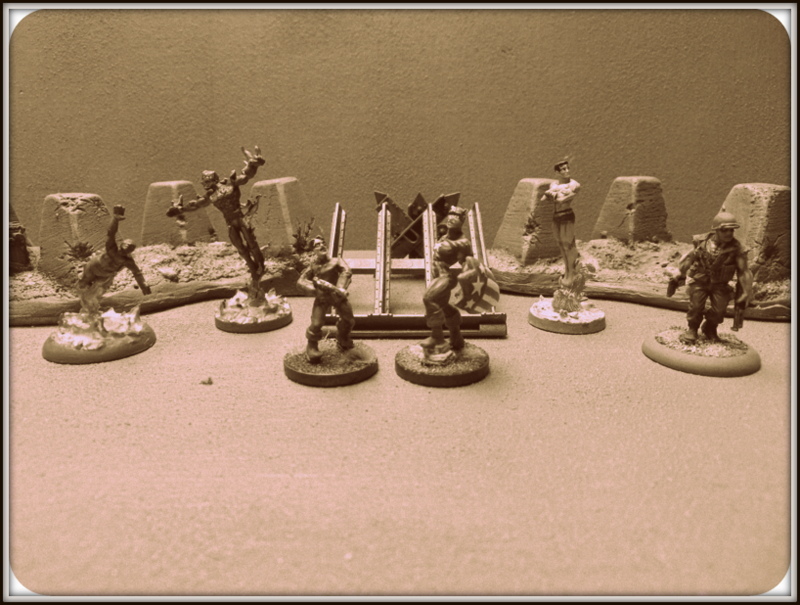 I do have a soft spot for all the heroes and villains of this era and have been considering doing the Crusaders for next year’s ‘Forgotten Heroes’, although no doubt I’ll change my mind before we get there! Count me in for next year, too. I’m considering the Hypno Hustler and the Mercy Killers!